I have a new favourite restaurant. I should qualify this with letting you know I have a new perspective on eating out, we now have a baby. But even with this new frame of reference I think that the Newmarket would still get into my top 5. The Newmarket delivered a taste sensation in every bite. They describe their food as ‘tastes of California with a wink to the south.’ The menu feels more Mexican inspired than a wink, with a mouth-watering line up of Taco’s under the title “Latin street food”. We chose the soft shell crab tacos with guacamole, shaved fennel, spicy corn & tomatillo salsa and the soft tacos with pork carnitas, baby gem pickled pineapple & hot adobe sauce. Both were served open, inviting a scoop and chomp movement delivering a nicely spiced heat. The crab was perfectly crisp and the pork combined with the pickled pineapple and adobe sauce were so good I came close to ordering a second serving – for dessert. Even at this point we decided we’d be coming back next week to polish off the rest of the list. The crispy chicken wing with peanut mole as well as the duck tinga caramelised onions, mescal, cinnamon & orange tacos will be first picks. Given this was only lunch, and the tacos were being washed down nicely with a couple of Mount Kosciusko Pale Ale’s, we decided to share a main and some exquisite charred, baked sweet potato. It wasn’t easy to choose. Around us, we observed tables of satisfied customers hoeing into tamarind glazed pork hock, the ‘special’ wood roasted chicken, and large black suckling pig with caramelized pears and lime. As a ‘sweet meat’ fan you can probably guess how tough a decision this was for me. 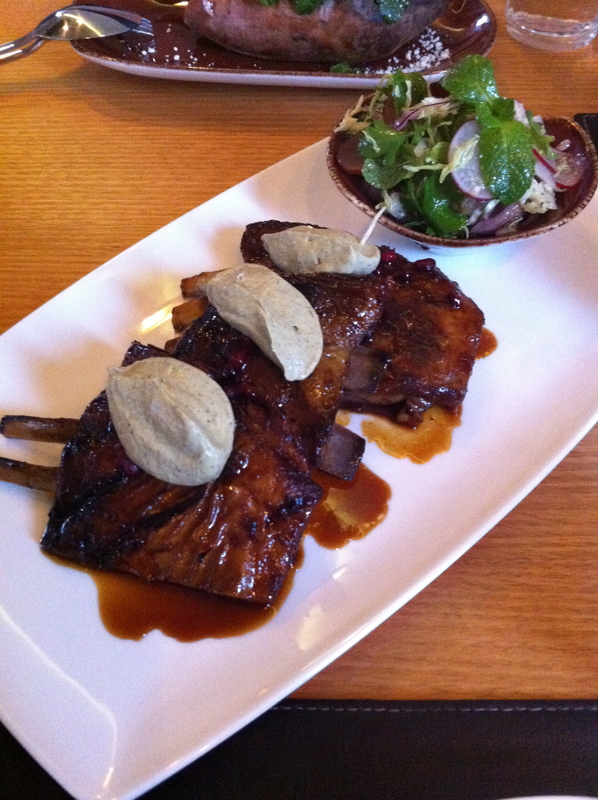 I managed to persuade V to share the lamb ribs barbacoa, pomegranate mole, avocado & tahini. Ribs have always been a favourite of mine, but they can also be hit and miss as a result of my excitement and high expectations. These were a massive hit. The sauce was the right blend of sweet and spicy with a hint of bitterness from the pomegranate. The avocado and tahini complemented the dish well despite some initial concerns over an intrusion from the middle east. The atmosphere was relaxed with a warm buzz of Saturday afternoon catch-ups and celebrations. Our new addition seemed comforted by the background beats, happily content in her yellow, wheeled cocoon. There’s a nice mix of bare concrete and sixties inspired, ‘naughty’ wall friezes that complement the low, open bar and hanging lights. 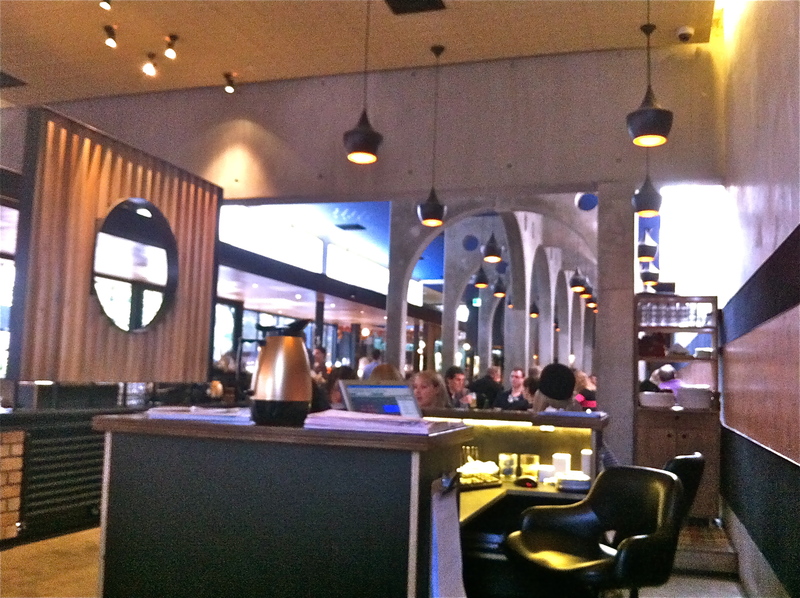 In fact, the Newmarket recently won the 2011 Best Interior Architecture Award from the Australian Institute of Architects. The menu was developed by Paul Wilson; the winner of 2011 Age Good Food Guide Epicure Professional Excellence Award. There might not be any awards for service. We were attended to efficiently, but a little more Californian ‘table’side’ manner would have been welcome. Although, reading the comments on The Age review perhaps we were lucky. As we finished, we pondered dessert. I was full, satisfied, purring about the taco’s, the meat, the experience. V asked if I was hungry. I wanted some more taco’s, I wasn’t hungry, the Newmarket has just made me greedy. The Newmarket is the brainchild of Julian Gerner and Tom Walker who have also brought the Albert Park, Middle Park and Royal Saxon Hotels to Melbournians. 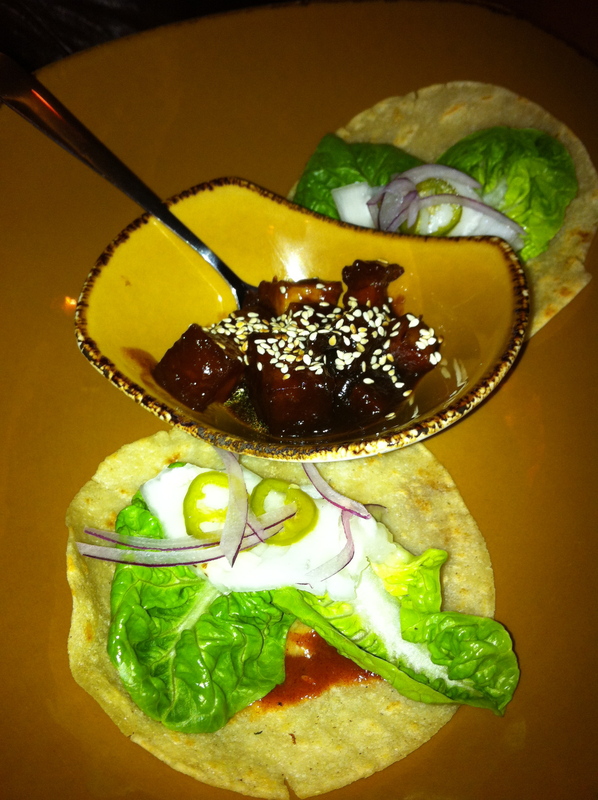 The original meaning of the word taco was a ‘plug’ or ‘wad’ to fill a hole in a wall. The only hole I was letting these taco’s fill was my own! Sold! Can’t wait to try this place. Finally ventured to Newmarket today. Was not disappointed. Fully lived up to expectations. Both soft tacos of pork carnitas and the prawn were delicious. Tried the caprese salad with heirloom tomatoes. Wished the tomatoes were a little more garden picked sweet, though the fior di latte lovely and accompanied by a fragrant and refreshing pesto, neither too oily or cheesy (infact, didn’t detect any). Just the right balance for a summer lunch. The pulled pork burrito was surprisingly mellow – which is absolutely a good thing. On first inspection I was wondering whether the tenderness of the pork may have been compromised with the frying of the burrito. Luckily, not the case.